We are very pleased to launch our new space with Graham Dolphin’s second solo exhibition with us. The new space is larger and with a more prominent street frontage on Bredgade. The exhibition consists of a series of large graphite drawings, three sculptural objects and a 2 channel video piece. Dolphin continues his fascination with the shrines and mythologies built around iconic stars, their deaths and the places and objects that gain significance through their association with them. Upon entering the gallery space the visitor sees a traditional, wooden church gate, festooned with graffiti and memorial offerings. Free standing in the middle of the space Gate 2011, is inert, it’s original function as a gateway denied. Seemingly a found object, Gate is a meticulous recreation of a pair of churchyard gates from the English village of Tanworth-in-Arden, the burial place of folk singer Nick Drake (1948-74). Virtually unknown at the time of his death aged just 26, Drake has since acquired a cult following, his tragic story adding to the iconic figure. Dolphin has transcribed tributes left at Drakes’ grave and those found online onto the gates. 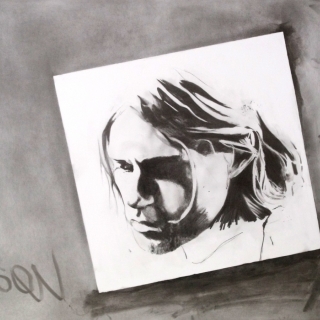 The series of drawings, Last View, depict the imagined last views of iconic musicians. The consistent element in each drawing is the sky, seen through windows or in the landscape. The foreboding and ever present clouds appear impassive and mute. These large drawings have a tight formal quality that echoes cinema screen, with a tragic darkness at their centre. The back of the gallery houses two sculptures, both entitled Door. On one wall stands an ordinary grey metal door, opposite it a white wooden door, both covered in scrawled grafitti. Like Gate, these entrances are denied any function now fluctuating between sculptures and paintings. Inspecting the graffiti on both doors we are given clues as to why these particular doors have been chosen. The grey metal surface of Door has the infamous words Kling Klang left by a fan along with the German word for power station, Kraftwerk. Home to the band Kraftwerks’ operations for 40 years, the Kling Klang studios in Düsseldorf are steeped in mystery, with no telephone or entrance markings, its location was unknown to everyone but the band until the turn of the century. Opposite is a more homely, interior, white wooden door, very worn with peeling paintwork. Prominently scratched into the door surface are the names Ian C, Peter, Bernard and Stephen along with the words Joy Division. This ordinary door has emotion imbued into it by the signatures left by the band and that of the subsequent fan tributes, the door originally stood at the entrance to Manchester studios where Joy Division performed. The final room contains a two monitor video piece. On entering the space we are hit with a cacophony of sound. The two monitors are placed back to back so only one screen can be viewed at a time. Sun Moon Sun shows a sun and moon moving slowly across the screen. Within the sun are images of the composer Sun Ra (1914-93), within the moon images of the composer Moondog (1916-99). Playing on the fictional names and biographies of these two avant-garde musicians, the film shows the waxing and waning of the sun and moon, from day to night, light to dark. The visual collage of the musicians is mirrored in the audio remixing and layering of the composers’ works, the apparent chaos of sound and image settles into a drone and trance feeling, present at the heart of both musicians’ works. Dolphin lives and works in Newcastle. He has had solo shows at Baltic Gateshead, Växjö Konsthall, Sweden, Regina Gallery, Moscow, Seventeen, London. His work has recently been shown at KIASMA, Helsinki, National Museum Norway, Oslo, Dublin Contemporary Biennale, Ceri Hand, Liverpool, Turner Contemporary, Margate. His works are in the collections of Middlesborough Institute of Modern Art (UK), Zabludowicz Art Trust (UK), Viktor & Rolf (UK), David Roberts (UK), Kevin Smith (UK), Jerry Speyer (US), CCA Andratx Art Centre (ES), Ole Faarup (DK), Asbæk Art consulting (DK), West Collection (US), Loewe Foundation (ES), Hope Collection (US), Museum Weisbaden (DE).